One of the first great gigs I got doing my string thing was for Henry Priestman and The Christians, in the 1990s. And I’ve worked on countless pop productions for Henry ever since. Then a year or so ago he came up with the notion of producing his own solo album. At the time, I joked with him he’d be doing Glastonbury before long. I put string arrangements on 3 or 4 tracks and the album was released by Stiff. But then it started getting Radio 2 plays – Wogan and Walker – and in comes Island Records, part of Universal. Island had been The Christians label. Now The Guardian are writing about him and Island will be giving him a big push in 2009, with the 1st single, Grey’s the new blonde. Good luck to you Henry! And can I just point out that I seem to remember doing strings on the cheap, so if I see you driving round in a Porsche I’ll be asking questions! Some jobs come in completely out of the blue – from a colleague of a colleague, that strange network in the freelance creative industries that is simply word of mouth. One of these, from earlier in the year, was a call from celebrated classical crossover producer Jon Cohen, meastro behind the sound of the Opera Babes and the Fron Choir amongst others. His project was even more unlikely (or so I thought) – an album featuring the pipes of the Royal Scots Dragoon Guards. 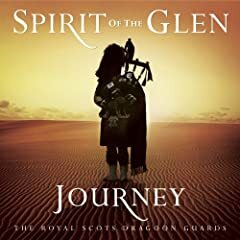 In the fascinating landscape that is the music market, I confess i didn’t think that the pipes of a military regiment would be a winner in 2008, but the album (Journey) reached 29 in the classical charts in the run up to Christmas. My involvement was straigthforward; the arrangements were done, save for a little score preparation, I just needed to create the realstrings audio. This was for 3 tracks on the album, the string work for the others had already been completed in Prague, so the project makes an interesting comparison between the 2 methods. Undoubtedly the sound of a large body of players in a large room is wonderful! But I reckon what we provided, in the context of the arrangements does the job absolutely fine. A most satisfying and fascinating part of my work is interacting with composers, quite a few of them. Their working practices might have some similarities but they are quite frankly all, creatively, different. You might think that composing conventions would lead to some similar characteristics, but in fact the only tangible thread I see in all of them is a personal one – the desire and confidence to achieve. That’s not to say I don’t see the occasional ‘wobble’! At least it proves they are human; but there is an overriding persistence and tenacity in their nature that motivates them to continue. Sure, the ability to create distinctive music is there as well. It means nothing without that desire to succeed. I have been contributing to Richard Jay‘s work over the last couple of years; he’s a composer and musician I have huge respect for and whose work must surely gain some recognition. I think he labels the style ‘chill out classical’ and I’m hopeful he will catch the imagination of the Classic FM community when he completes his album project in 2009 – a diverse collection of compositions, beautifully crafted, emotional and expressive. He’s just posted a video of one of the early tracks I worked on, Gone but not forgotten, featuring Davy Spillane. Even before this video, the composition had a big character – the video serves to communicate yet more emotion. Another demonstration of how video and music enliven each other. Hear more of his work on his myspace page.